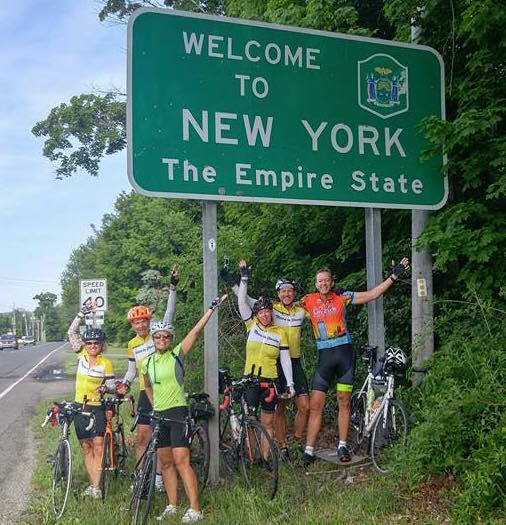 Lisa and her fellow riders celebrate reaching New York. Lisa Portelli was in a foreign place the other day, behind the wheel of her car on her way to a business appointment instead of on a bike seat. A board member of Bike/Walk Central Florida, Portelli recently completed a nearly 2,000-mile cycling trip, riding from Portland, Maine to St. Augustine with seven fellow bikers. They rode from 80 to 140 miles a day. “Absolutely, it was the ride of my life,” she said. Biking, she said, is the best way to see the country. Early during the trip, she said, they rode a more leisurely pace, stopping often when they saw something interesting and taking pictures. One day in Pennsylvania, they visited with a Mennonite family. Typically, the group would leave their hotel about 6 to 6:30 a.m. and ride until 5 p.m., often going to bed by 9 p.m. because they were so tired. When they got to South Carolina and Georgia, however, they picked up the pace because of the unrelenting heat, which seemed worse with the hot air radiating from the blacktop. In addition to Gramling and Portelli, the group also included Ruth and Keith Sherrick, Marion Kusters, MaryLu Williams, Ed Bennett and John Ward Smith. Rob Link drove the car and rode much of the way, too. Portelli, who figures she spent about $2,400 on the trip, said planning and patience are key to riding long distances. “You have to have a lot of respect for each other’s differences,” she said. Portelli credited “positive group dynamics” for making it through the 19-day journey, which ended June 16. Like any challenging physical endeavor, the ride was filled with adrenaline and endorphin highs of riding through arduous terrain and weather, but also the lows of leaving one rider behind in a New Jersey hospital and learning by smart phones of the tragic nightclub shooting in Orlando during the early morning hours of June 12. The group discussed quitting after fellow biker Don Gramling catapulted over his handlebars and hit the ground. He lost control after skidding on a patch of gravel while going downhill. Gramling suffered a concussion, seven cracked ribs and a broken pelvis and hip and is recovering in Jacksonville. Just as devastating to Portelli and her group was the news of the mass shooting at the nightclub Pulse. All the riders quickly called home, checking on friends and family, then stopped often to read updates on their phones. They pedaled on rather than stopping because they had little choice. They only had one driver in a small car carrying all their belongings — other than their bikes. “Absolutely,” said Portelli, who already is planning two week-long cycling trips for 2017.